We operate in three segments – Gathering; Processing & Storage; and Terminaling & Export – primarily in the Bakken and Three Forks shale plays in the Williston Basin area, one of the most prolific crude oil producing basins in North America. Hess Midstream Partners has a 20 percent controlling economic interest in a system of gathering pipelines that support production growth in the Bakken. 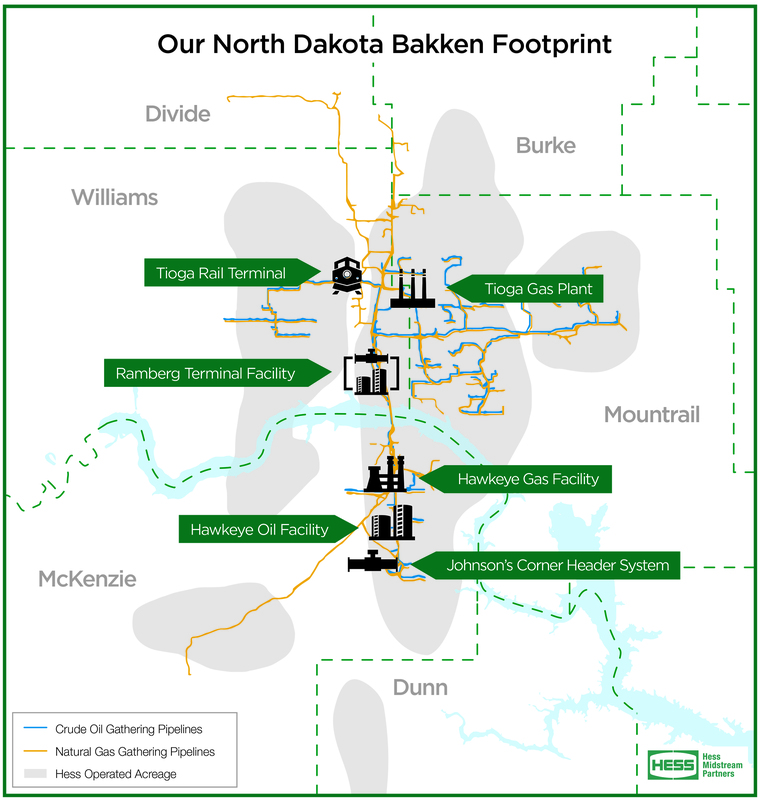 These pipelines compress and move crude oil and natural gas from remote wells to processing and storage facilities. The system can increase its capacity via installation of additional compression equipment. To see more information click here. Hess Midstream Partners has a 20 percent controlling economic interest in a large, strategically located gas plant and 100 percent ownership of a propane storage terminal. To see more information click here. Hess Midstream Partners operates integrated, interconnected terminal facilities that provide flexibility for export. This includes a truck and pipeline terminal, a rail terminal and rail cars, and a header system that is under construction. To see more information click here.